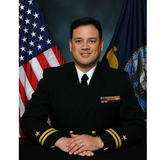 Director, Navy Band Great Lakes. Currently pursuing a Doctorate of Strategic Leadership at Regent University. I have served over 20 years in the United States Navy Music Program. As an enlisted Sailor, I was a French Horn Instrumentalist, Unit Leader, Ceremonial Conductor, and Instructor. My commissioned assignments include Assistant Leader of the United States Naval Academy Band, Training Officer at the Naval School of Music, and my current assignment as the Director of Navy Band Great Lakes. I have also served in a variety of churhc leadership ositions including Deacon, Worship Leader/Choir Director, Men's Ministry Leader, and Adult Bible Study teacher. An experienced leader, I have successfulyy built cohesive teams, designed and implemented training programs, been a project manager, and led large organizations through restructuring and significant change management efforts. Director of Training for four accredited courses of instruction. Directly supervised 32 military and civilian instructors and staff in their daily duties. Managed an annual student throughput of over 200 professional military members. Oversaw Council on Occupational Education and Merican Council on Education accreditation assessments of curriculum which resulted in a 30% increase of college credits awarded to students attending the courses. Directly supervised 66 professional military members in nine independent units in their daily operation sof over 800 enagements annually. Managed an annual budget of $180K. Oversay a near 50% forced manpower reduction while maintaining complete mission readiness and completion. Patrick Hill updated their profile information. Patrick Hill changed their profile image.